So how PointySonic's compatibility with NiGHTs stages was gonna go has been hanging in the back of my mind for a while as I work on this. 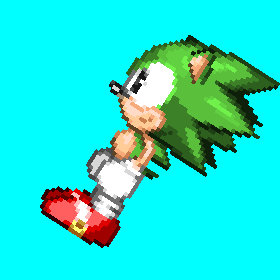 Rotating and polishing so many frames is rough, tedious work and frankly I simply don't want to do it, so if I didn't have any way to work around it I was simply not going to have special stage compatibility for Pointy. MPC's image rotation code is interesting, but still a long ways from being usable. But I came up with an idea. In SRB2, the sprites get upscaled once they're in the game, and upscaled sprites are much easier to rotate with no polishing or detail loss in the process. So what if I just upscaled the sprites, rotated them, then put them in the game pre-upscaled, rather than letting the game itself upscale them? It came out looking pretty good! However, since the sprites in the wad would now be 4x scale, that also means greater wad filesize. For comparison, that test sprite upscaled is 9.65kb. The side standing frame at the regular 70x70 size is 894bytes. That's a pretty dramatic size difference, which could stack up quick when working with multiple frames. We'll have to see how the filesize looks once I actually have the NiGHTs frames finished, but for now this is a much easier way to add NiGHTs compatibility. If I have to, I could just separate the NiGHTs frames into a second wad, so you would have to add pointysonic.wad and pointysonicnights.wad if you wanted special stage compatibility while playing. Yeah, I have to say, after seeing Mania's animation shorts, Toon Sonic, and Chrispy's running animation, I'm pretty much sold on the idea of erect spikes being canon. What really fascinates me is how different this looks from Motor Roach's FSonic, and yet how both of them are equally as stylish and fun to look at. I'm honestly torn between the two. Yeah, off-grays in general are under-appreciated. They're probably a little harder to utilize in SRB2 due to the whole issue of palette swapping -- in particular, a certain off-gray may look good on a certain skincolor and less appealing on others... but I don't think that would be much of an issue here. 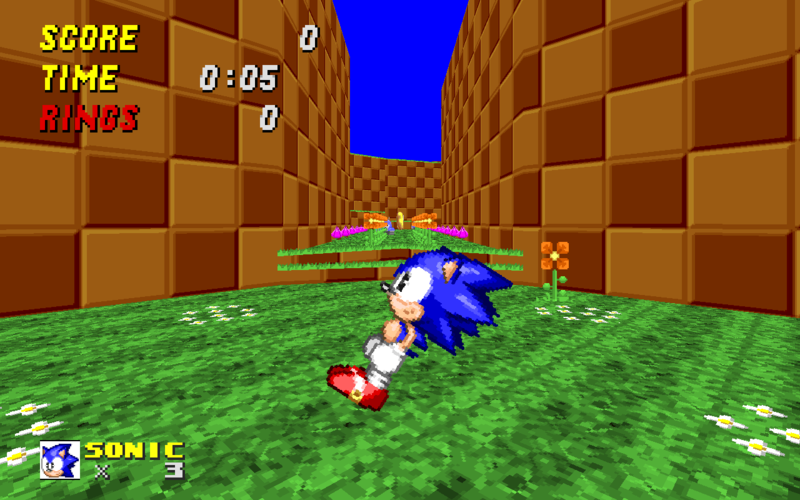 For what it's worth, steel blue definitely matches Sonic's default color better than standard gray. Yeah it would probably be nice if I could use the greens to shade the whites so they change color with the skins, but the blue will probably work well regardless. Even when he's not blue, the blue helps convey a sense of coolness with the shadows. Chrispy and I are implementing the freshest features for you to enjoy, don't you worry. Id also like to take this opportunity to mention that I've scrapped the nights frames because I don't wanna. Last edited by Chrispy; 03-03-2019 at 07:26 PM. Fantastic! It seems like this would fit as a companion to the new Tails really well. For sprite rotation, have you tried resizing the sprite to 2x, doing rotation, then resizing back down? How does that look? That method would still require a lot of polish. No matter how you go about it, it feels like way too much for a minigame to me, so I just chose not to do those frames. I'm glad to see you're excited for the launch though!